You know when you get home from a long day and have no idea what to eat? You open the fridge and stare for a while, stumped. Then you spot that one magical ingredient and smile. For me, that magic ingredient used to be marinara sauce. We've all been there, right? Pasta. Night after night. No matter how much you love pasta and no matter how healthy you make it - you know, by throwing in tons of spinach, chick peas, whatever - it's still pasta and it's far from a perfect meal, especially when you have it more than once a week! Enter my new magic ingredient: beans. Pinto. Kidney. Black. Lentil. 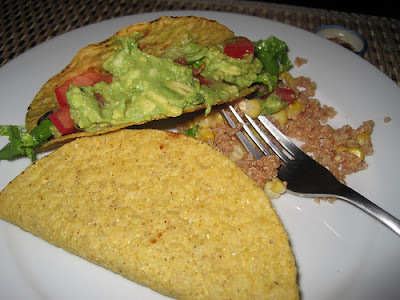 Whichever I happen to have on hand work just fine in this tasty taco recipe! The best part is that you can keep most of the (cheap!) ingredients stocked and improvise based on what you have on hand. Oh, and you can whip these up using the microwave and toaster oven if you want! No need to heat stuff on the stove, though that does improve the end result! Can you find a mult-grain version at your grocer? Skip the pre-shredded stuff. It's loaded with preservatives and anti-caking agents, doesn't taste as good as the blocks, and is 2-3 times the price! Go for a local organic Cheddar labeled "RBGH free"
Monterey Jack or Pepper Jack work too! Use this instead of sour cream! Tomato Paste and/or Diced Tomatoes are nice to have if you have time to heat stuff on the stove, but it's not necessary. Preheat Toaster Oven to 300. Slice the cheese (and tomato if using) into small pieces and lay flat on inside of taco shells. Pop them in the toaster oven for 5 minutes while prepping the rest. Keep an eye. Toaster Ovens can be finicky. black, kidney, pinto, or vegetarian refried are my favorites! Take a bite and smile because you just found your new favorite super fast dinner! Heat a tablespoon of olive oil on medium heat. Add 1/2 a finely chopped yellow onion and 1 minced clove of garlic. Saute for about 5 minutes, until onions are soft. Season with spices listed above. Cook for about 10 minutes over medium heat, uncovered, stirring every couple minutes. 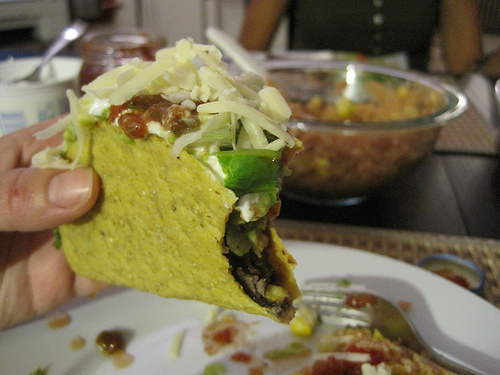 Top with salsa, taco sauce, yogurt, shredded lettuce, chopped red onion or scallions, and/or cheese! Taco night with my roommate, Tandis! PS: A side of quinoa or brown rice completes this meal nicely! Last winter, I got a few pounds of blue potatoes in my Boston Organics shipments. They were delicious, but a few went past their prime before I had time to cook them. Determined not to let them go to waste, I studied up and figured out how to plant them. Fast forward a few months, and I had a full harvest Somerville-grown Blue Potatoes! Fresh potatoes store well for months in the right conditions (cool, dry, and dark), so I decided to save most of my harvest for a chilly winter evening, envisioning a beautiful BLUE potato and leek soup! Saute the leeks, celery, and carrot in the olive oil over medium for about 10 minutes, or until the softened. (Tip: Keep the pot covered when sauteeing veggies for soup. It locks in the moisture and speeds up the softening.) Add the garlic and some salt and pepper and saute for another 5 minutes. Turn heat to high, deglaze the pan with the dry sherry, pour in the broth and cover. Bring to a boil and add the potatoes. Make sure there's enough liquid in the pot to cover the veggies. If not, add more broth and/or water. Cover and return to a boil. Gently boil for about 10 minutes, then lower heat to medium and simmer for 30 minutes or more (30 is the minimum to cook the potatoes through, but the longer you cook it for, the more time the flavors have to get to know each other). Add the fresh herbs toward the end of your cooking (maximizes flavor and nutritional value). Blend with an immersion blender or in batches in your blender (or don't blend at all if you prefer a thinner chunky soup!). Finish with freshly ground black pepper to taste and top with a drizzle of Extra Virgin Olive Oil, a dollop of Greek yogurt, or a small handful of freshly shredded cheddar (or all 3!).Enjoy! 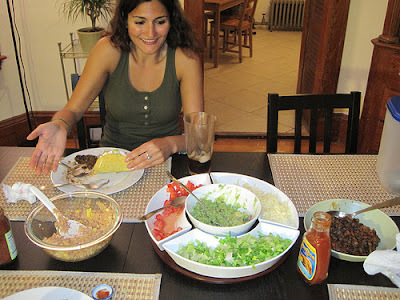 My friends and family routinely float online articles about food past me for my thoughts. Today, my mom asked my thoughts on a yahoo article by none other than the Eat This! Not That! guy David Zinczenko. First of all, let me say that I think the well-intentioned Zinczenko routinely oversimplifies his nutritional suggestions, creating false choices for the hundreds of thousands of people who have likely read his books, articles, and magazine (he is the editor of Men's Health). He makes some valid points (I highlighted the things I agree with in yellow) in his recent yahoo article, The Truth About Milk, which is copied below. But unfortunately, he misses the point. Overall, I simply don't think milk is worth drinking for nutrition's sake. The evolution of how people even came to drink milk is interesting in and of itself and when you examine the societies who drink milk today, America tops the list (arguably because the USDA is in the back pocket of the dairy industry and has been brainwashing us with its health benefits for decades). Part of the reason for that is that much of the world remains lactose intolerant. People of African and Asian descent have strong negative reactions to lactose because they don't have lactase in their stomachs to break it down. America is more diverse now than it was 50 years ago and part of the reason milk consumption has declined is likely related just as much to that as it is to the marketing of cheaper, sugar-filled alternative drink options. I do think (and history and nutrition confirm this) that the right way to consume dairy is in the form of cheese and yogurt (the real stuff, not American cheese or dannon/yoplait yogurt)! The addition of bacteria to dairy helps break down the lactose. Aged cheeses are practically lactose free, as are cultured yogurts, making it more easily digested and more nutritionally beneficial. The stuff I blatantly disagree with in this article is highlighted in red. I also added notes in blue. Milk: Healthy and nutritious drink, or fattening, contaminant-filled menace? You might expect an organization called the Dairy Education Board to promote milk as a good thing. But instead, this advocacy group claims that “Milk is a deadly poison.” Oops. And as Americans have grown more wary of saturated fat, and more concerned about hormones and other substances fed to—and injected into—dairy cows, milk consumption has fallen dramatically. In the post-war days of 1945, the average American was consuming 45 gallons of milk a year. By 2001, per capita consumption was down to just 23 gallons. In 1945, most of America was WHITE and milk wasn't full of puss and then pasteurized to kill the germs in the puss, as it is today! You got your milk from a local dairy by way of a milk man, right??? But here’s the thing: Plenty of new research says that we should be drinking more milk, not less. (most of this research is funded by... ahem... the dairy industry!) In fact, swapping soda, juice, sweetened iced teas, and other beverages for milk might be one major reason why Americans are gaining weight at such a rapid pace. (fair enough) Milk not only helps boost protein intake and cut down on sugar, but consuming calcium through dairy foods such as milk may actually reduce the fat absorption from other foods. (Our bodies don't absorb the calcium from dairy as well as we absorb calcium from calcium-rich plant sources! we can also dramatically increase our calcuim absorbtion by pairing it with citrates, so calcium fortified OJ might be a better source than milk!) Who wouldn’t want that? Here are four milk myths you might have heard, and why you should consider answering the cowbell more often. The Truth: Maybe. In a 6-month study, University of Tennessee researchers (who funded this research?) found that overweight people who downed three servings a day of calcium-rich dairy lost more belly fat than those who followed a similar diet minus two or more of the dairy servings. In addition, the researchers discovered that calcium supplements (what kind of "supplements" are we talking here? I hate how this stuff is over-generalized. As we know, there's a wide variety of supplements availalbe and it's hard to know which ones are best absorbed by the body unless you have a lot of expertise in nutrition and biochemistry! Any walk down the vitamin aisle makes my head spin!) didn’t work as well as milk. Why? They believe that while calcium may increase the rate at which your body burns fat, other active compounds in dairy (such as milk proteins) provide an additional fat-burning effect.